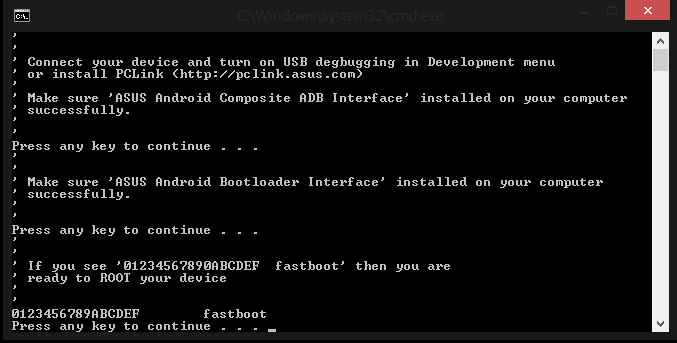 At this post will be using a tool made shakalaca, specifically to do Rooting the device Asus Zenfone. Not only is the tool that can do so, but there are many tools that are also made especially for doing Rooting on android devices that exist, such as RootGenius, iRoot, KingoRoot, KingRoot, OneClickRoot, SRSRoot, MobileGo, and others. 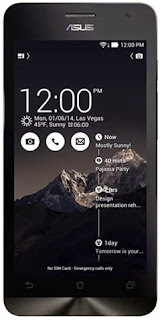 Way above will require a computer as their place to walk, but there are some applications that are also made especially for Rooting Android devices that can be directly run on your Android, such as KingRoot Mobile, RootGenius Mobile, iRoot Mobile, KingoRoot Mobile, 360Root, TowelRoot, FramaRoot and others. At your Asus Zenfone, turn on USB Debugging Mode. Download and install the Asus USB Driver and Asus PCLink on your computer. Now, connect your Asus Zenfone to a computer using a USB cable. After the device Asus Zenfone you really connect with the computer, then click on the file "CheckBeforeAction.bat". If the device Asus Zenfone you are qualified, you can now double-click on the file "Root.bat"
After that, you will see some process on the computer screen and Asus Zenfone you, wait until there is a message "Finished" and Asus Zenfone you will restart automatically. If Rooting really successful, so now you can see SuperSU application on your Asus Zenfone application menu. Optional: You can verify whether you've Rooted Asus Zenfone or do not use the Root Checker app. 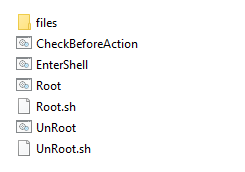 Asus Zenfone UnRoot way: If you change your mind, you can UnRoot your device by clicking twice on the file "UnRoot.bat"
, rooting, pleas be patient..
Disabling other devices (Bluestack), if necessary uninstall. netstat -aon | findstr "5037"
tasklist -fi "pid eq 3088"
Note: The number 3088 on top of the dressing with four numbers that appear at the top of the list in the Command Prompt. Update driver ADB in Device Manager. Make sure the USB driver is installed correctly. "fastboot is not recognized as an internal or exsternal command........."
" sleep is not recognized as a internal or external "
0 Response to "How To Root Asus ZenFone 6 (Kitkat/Lollipop)"